Just when the Nokia Lumia 520 and 720 were spotted in an Indonesian carrier database, and we are now getting the scoop on the specs sheet. 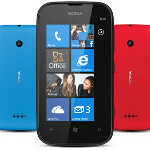 A tipster has sent a little insider info about these two upcoming Windows Phone 8 handsets from Nokia. Lumia 520 will have 4" Super Sensitive screen, 1Ghz Dual-core, 512Mb RAM, 8GB storage, microSD, WP8, 5MP with no front camera. It will all come down to the design of the devices...!!! 620 seems better than this two except for the display size. 3MP, 5MP,8MP's are okay. but, what the heck is 6MP camera.???!!! I have a Nokia with a 8mp camera. It shoots in 6mp in default settings for a 16:9 ratio. I have to manually change to 8mp. I guess that produces 4:3 images. Nokia is surprise me every time before launch event.......!!! bring it on nok....!! !